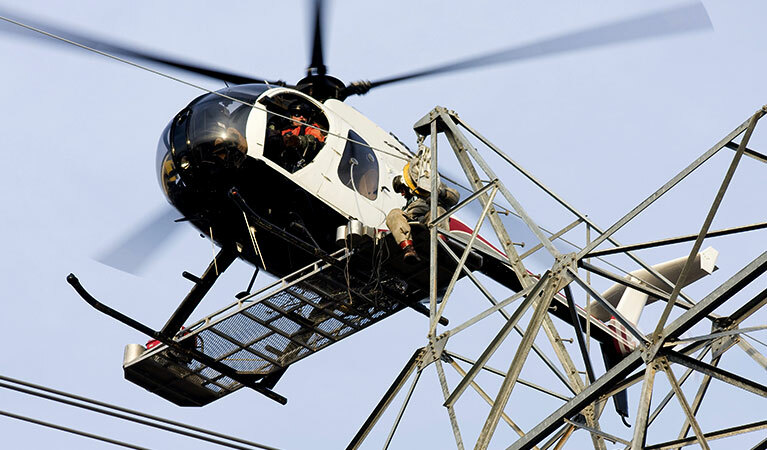 Receive more information on the benefit of helicopter within the utility industry in Arkansas. FairLifts is a leader in the reservation of helicopter support for utility installation services for Arkansas transmission line construction. Through access to an extensive network of local and global operators, FairLifts specializes in the securing of professional grade aerial support services for electric companies and contractors in their efforts to expand connectivity across cities, states, and regions. A helicopter's inherent design makes the aircraft an effective tool when used effectively in the utility construction and maintenance industry. This is due in large part to a helicopter's capability to hover for an extended period of time, to fly at lower and into higher elevations, and to transport heavy or over-sized loads. Helicopters can additionally achieve access to remote and impassable destinations making them vital to utility installations in areas of diversified terrains. In the past, utility construction and transmission tower installation, even inspections, took several weeks or months to complete. With the integration of helicopters to facilitate aerial support, these types of projects are able to be completed within days and hours. As we mentioned before, helicopters are integral to the construction of new transmission towers and stringing of lines in areas that may prove challenging for linemen via traditional means of transport. Especially in remote destinations, those situated in higher elevations or where environments are considerably less stable. This is the case in some areas in Arkansas, where, despite being beautiful, are possessing of an exceedingly varied topography. As the population in a specific region grows, so does the demand for electric connectivity. In Arkansas, where there are a number of hills, peaks, valleys, and environmentally protected regions, this can be challenging for utility companies. The electric company’s best bet is to secure the services of a reliable helicopter operator to facilitate the transport of personnel, equipment, and materials to the installation site, regardless of where it is. As recently as last year, utility giant Entergy engaged the use of helicopters in efforts to replace electric power transmission lines and outdated wooden utility poles along a 107-mile stretch that extended from the eastern edge of Arkansas and ran on into the centermost portion of the state. Helicopters were able to assist in exchanging worn wooden poles with more modernized steel variants and to string the wires, effectively connecting even more communities and avoiding mass power interruptions. FairLifts agents are experts in procuring specialty helicopter services for electric companies and contractors in Arkansas. The reservation process is simple and convenient. Agents source aircraft, operators, and equipment from an extensive network of providers located locally as well as globally. To learn more about the variety of helicopter-assisted utility services in Arkansas at your disposal, read on. Heavy lift helicopters are used to transport materials, gear, and work crews to installation sites remotely, offshore or in high elevations. Materials used often in utility construction like tubular steel, concrete, and wood are transported via cables affixed to the bottom of heavy lift capable helicopters that can safely transport and effectively fly while carrying extremely weighty loads. Helicopters are used in the stringing of wire on transmission towers in remote or hard to access locations as well as in areas across Arkansas where the terrain may be especially rugged. Utilizing helicopters means wires can be strung in half the time it takes ground crews to travel to the installation sites, climb the poles or elevate themselves via bucket trucks. Helicopters are used often in utility pole installations, specifically with regard to setting new poles and in upgrades to outdated existing poles. Not only can helicopters help to set the poles, they can also transport the materials and gear needed to the site and remove leftover debris following construction. Aerial inspections in helicopters offer a 360-degree field of vision over power grids and electrical installations. The wider viewpoint yields a more accurate result and allows for inspections of ROWs, pipeline and transmission towers to be carried out more swiftly. Helicopter transport can be arranged to deliver work crews to offshore oil rigs and utility installations, to job sites that are remotely situated or destinations that prove a challenge to access. Logistical transport can be arranged for senior executives looking to tour tower installations and lineman performing inspections. Receive a quote for your transmission line job in Arkansas instantly! The process to reserve helicopter support for utility construction is simple and convenient when you contact FairLifts. Agents are available night and day to coordinate an array of helicopter services to help you complete your project swiftly, accurately and effectively. All we need is the project specifics and information about how we can best serve you and we will uncover a professional solution so you can easily achieve your project’s objectives. The first step is to call or fill out our convenient form, you can access this form by navigating to our contact page.